In case you don’t follow former Virginia Attorney General Ken Cuccinelli on Facebook, lately he has been expressing a lot of strong opinions regarding politics. I don’t know about you, but the fact that Ken Cuccinelli is willing to take a stand on principle, even when it means calling out members of his own political party, is one reason why I like Mr. Cuccinelli. But wait a minute, the astute observer might say. If you like Ken Cuccinelli why did you support Robert Sarvis over him in 2013? How can what you say above make any sense? Well, just about every Cuccinelli supporter I know is of the opinion that the 2013 Cuccinelli campaign was one of the worst run statewide campaigns that Virginia has ever seen. Rather than highlight any of the positive aspects of Ken Cuccinelli as attorney general and a state senator beforehand, his campaign instead focused on painting Terry McAuliffe as a sleazy, unelectable dirt-bag. Although they succeeded in creating a general disdain for McAuliffe, the McAuliffe campaign successfully defined Cuccinelli as a scary right-wing zealot out to control every aspect of our lives. I’ve seen far too much fearmongering and incivility in politics in recent years and could not be an advocate of either. For that reason, and several others, I could not support Cuccinelli and decided to latch on to the one campaign that offered a clear message of liberty and hope, Robert Sarvis’. Shortly before Election Day, several of us, including the chairman of the Harrisonburg Libertarian Party had the opportunity to speak one-on-one with Ken Cuccinelli. I told him that his campaign had to offer voters a positive message, that there were a number of reasons why citizens cast their votes for him in 2009 and why they should do so again in 2013. He did have one video, which I thought was great, but I said he needed more like. I was told the funding wasn’t available and that the negativity was the only real course available. The Ken Cuccinelli I knew, that I ardently supported in 2009, the one that would stand up for principle even when in means bucking his party, the one who got kicked out of the GOP in 2011 for supporting an independent candidate over a poor Republican choice, was lost amid the campaign. But, once the campaign was over and McAuliffe was sworn in as our new governor, I noticed that the Ken Cuccinelli that I knew, the one who boldly takes a stance for what he believes in was making a comeback. Now, do I agree with every position that Ken Cuccinelli takes? Over course not! But it was a very encouraging sign and thus I had a strong desire to speak to the former attorney general once more and reached out to his staff. Shortly before the 2014 elections, I had the great opportunity to speak to Mr. Cuccinelli again. I hoped to discuss the 2013 campaign and his efforts in promoting liberty through his new role with the Senate Conservatives Fund. Unfortunately, some of the scars from last election had not fully healed and so our conversation was cut short before we could explore the second topic. Although I think I failed, I was trying to provide whatever limited advice I could, not to maliciously reopen an old wound. Regrettably, I’ve discovered that when a person holds or is running for an elective office, they often disguise or mute their true political opinions. I’m wondering if Ken Cuccinelli was elected governor (and I think he would have made a far better governor than Terry McAuliffe) would he be presently hamstrung too? Once they are no longer in position of power or are planning on seeking election do we catch a glimpse of the true colours of politicians? In 2013 Republicans got a taste of liberated and vengeful Bill Bolling and in 2014 they might have finally realized that one could only laughably call former Senator John Warner a conservative. So, today I’d like to take a moment to recognize Ken Cuccinelli. I’m glad to see him speaking out whether it is admonishing either Democrats or Republicans who seek to expand the power of government, strip away our freedoms, or funnel our money to further crony capitalism. Don’t ever obey the voice that tells you that you must stand by your party regardless of their actions. Keep fighting the good fight, sir! I’m sure that many of you were shocked by the closeness of the U.S. Senate race here in Virginia. After all, who would have predicted that Democrat Mark Warner, who beat Republican Ed Gillespie by at least nine percentage points in every poll but one, would emerge victorious by only about half a percentage point? Also in the race was Libertarian candidate Robert Sarvis. Sarvis, as many will remember, ran last year for governor capturing 6.5% of the vote in a race where only about 2.5% separated the Republican and the Democrat. As such, a number of Republican activists blamed Sarvis for that outcome, claiming that he siphoned enough votes from Ken Cuccinelli to allow Terry McAuliffe to claim victory. Given that Libertarian Robert Sarvis won almost 2.5% of the vote in this election, some Republicans are claiming, once again, that Sarvis stole another election from them. The theory behind this argument is that without Sarvis in the race, most of his supporters would instead choose the Republican candidate. In 2013, exit polls showed that a greater percentage of Sarvis voters would have selected the Democrat over the Republican if he were not in the race. After all, he captured more liberals than conservatives, more young than old, and more college graduates than graduates. These are groups that typically trend toward the Democratic Party. Although I haven’t seen the exits polls for 2014, I believe the opposite happened this time. A larger percentage of typical Republican voters cast their ballots for Sarvis than the Democrats. Almost all self-identified liberty-minded Republicans that I know either cast their ballots for Sarvis or simply left it blank. Stealing something implies that you have taken something that doesn’t belong to you. I would argue that no candidate or party has an automatic right to any person’s vote regardless of their previous voting history or ideology. Votes are always earned and must be re-earned each and every election; they never should be taken for granted. We aren’t political slaves! Let’s rewind the clock to the 2002 U.S. Senate election in Virginia. That was John Warner’s last election. You remember John Warner, don’t you? He was the long-serving Republican Senator from Virginia who recently endorsed Democrat Mark Warner for Senate. As a result, some people now consider him a traitor. But this recent revelation conveniently overlooks the fact that he rarely fought for the supposedly Republican principles of restraining the power of the federal government. In addition, he supported gun control and abortion, two positions in stark contrast to a majority of Virginia Republicans. And then there is Warner’s proclivity to oppose the “Republican team” as he did when he denounced Ollie North in 1994 and Mike Farris in 1993. 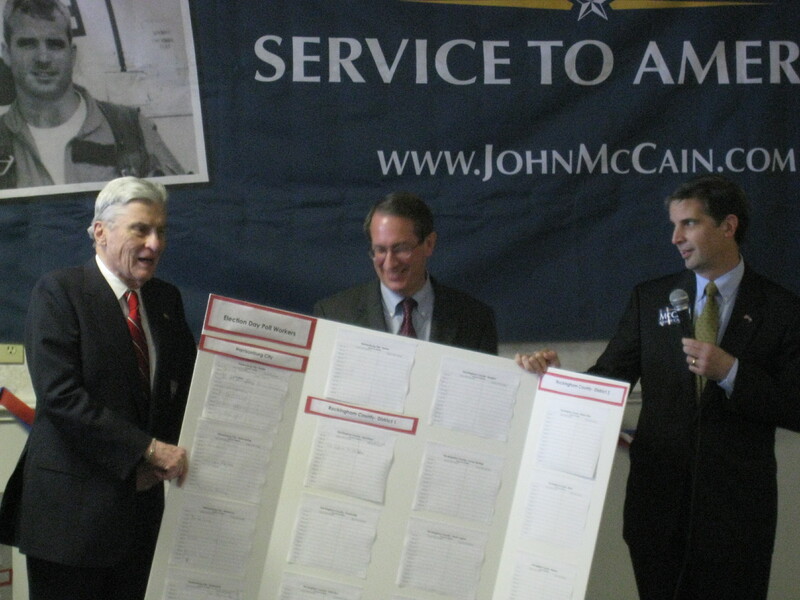 Even though John Warner and I shared the same political party back then, I could not bring myself to vote for him and thus left that portion of the ballot blank. Did sticking to my principles make me a “bad Republican”? As stated, this year many conservatives and libertarians who consider themselves Republicans did not feel that Ed Gillespie shared their principles and thus either cast their vote for Sarvis, wrote in Shak Hill, or didn’t vote at all. Who can blame them? After all, the last time I spoke to Ed Gillespie, I asked him which unconstitutional federal agencies would he work to eliminate, his response was that he would “check with his advisers and get back in touch with me”. For someone who believes the federal government has grown too large, that answer was unacceptable and showed, much like Warner over a decade earlier, that he and I disagreed on the most important and fundamental principles of our constitutional republic. Like 2002, if I didn’t have an acceptable option, I simply would not have voted for any of the candidates for Senate. So, yes. If Robert Sarvis had not been in the race, Gillespie might have ended up winning. But regardless of my opinion of Sarvis, I’m glad that voters had a third choice so they didn’t have to simply vote for the lesser of two evils. The Libertarian, Green, and Constitution Parties, as well as independents have as much of a right to run candidates as the Republicans and Democrats. And, if voters believe that their candidates are better than one or both of the major party candidates, then perhaps they ought to solve this problem by running better candidates. Or, given that Sarvis used to be a Republican, perhaps they ought to work harder to grow the party and stick with their supposed principles as opposed to driving folks away or simply kicking people out of the party as they did in my case. Just don’t complain that the election was “stolen”. One big headline before the 2014 Virginia Republican convention was former Republican Senator John Warner’s endorsement of Democratic Senator Mark Warner. In 1996, the Warners faced each other in a Senate race with Mark Warner finishing surprisingly well for a first-time candidate 47.4% to 52.5%. However, as fellow Shenandoah Valley blogger Lynn Mitchell and the Roanoke Free Press report, since that time more former Republican elected officials have come out in support of the Democratic Senator including a handful of former delegates, state senators, and even a former governor. I must confess, at first glance this news seems rather curious. After all, one could argue that the establishment candidate (Ed Gillespie) won the convention. If the more conservative Shak Hill had emerged the nominee, then this result would be less of a surprise; one could label it a establishment backlash against the grassroots. What can we make of this situation? 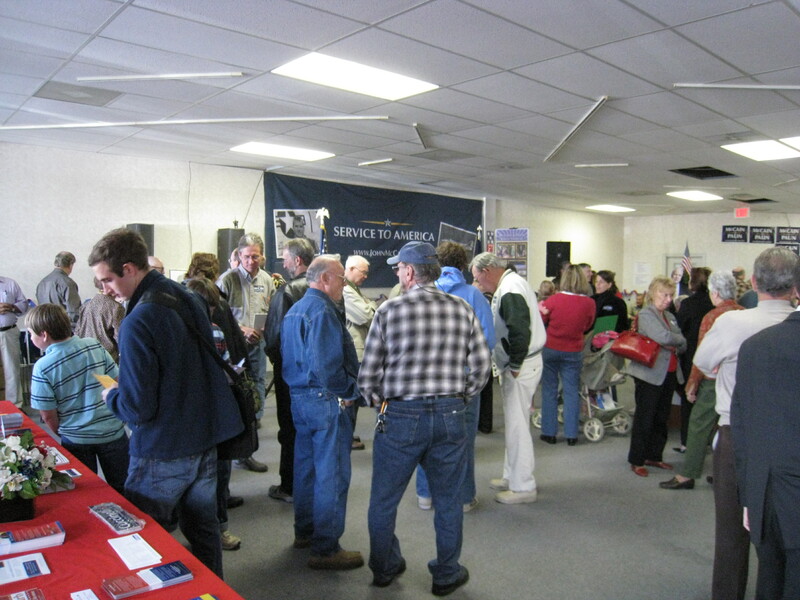 Does it signal a terribly weakened Virginia Republican Party? Does the GOP have little ideological cohesion where loyalty to the party, even from former elected officials, is not a certainty? Or is it the case that Mark Warner is simply that popular with a multitude of demographics across the state and/or Ed Gillespie is that unpopular? So what does all this mean? Will there be additional Republican endorsements in the days to come? And will the grassroots rally behind Gillespie even though some consider him insufficiently conservative or will they launch a protest vote with Robert Sarvis? Most pundits already predict a Warner victory and so the more interesting question to ask is, what will this situation do to the Republican Party in Virginia? Well, it turns out that GOPguy1 was right. 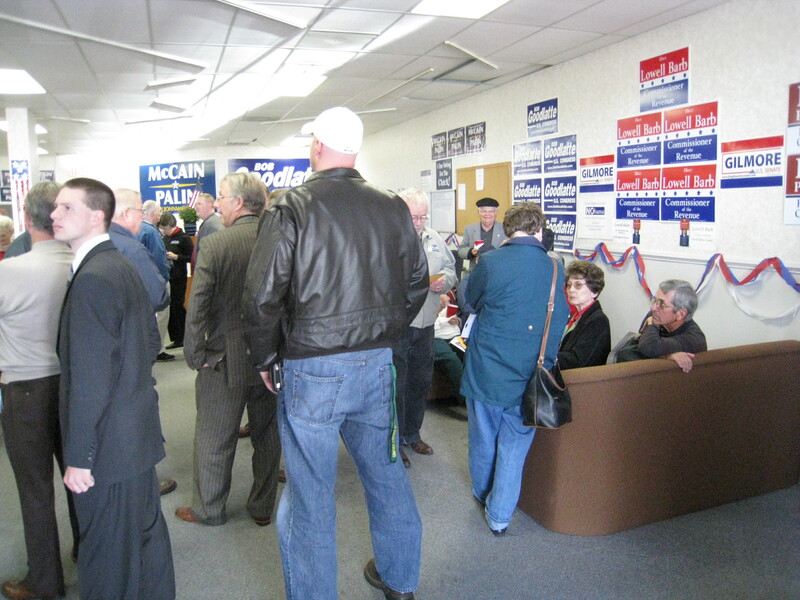 The event on Tuesday at the GOP headquarters served as little more than a McCain pep rally. I’m not quite sure why they did not label the event as such ahead of time. The HQ was pretty crowded and, as expected, the three politicians showed up late. Looking around, I saw they’d gotten a bunch of new high tech phones that likely came from the RNC. State Senator Obenshain (26th-R Harrisonburg) was in attendance too. As you might know, I was hoping he would’ve run for Attorney General in 2009, but I suppose we’ll have to wait another four years. I don’t know where our Delegate, Matt Lohr (26th-R Broadway) has been keeping himself. Although I don’t attend every GOP event here, I cannot recall the last time I saw him. I wonder if he has been intentionally staying out of the limelight (for some unknown reason) or if he is just busy with his farming duties. 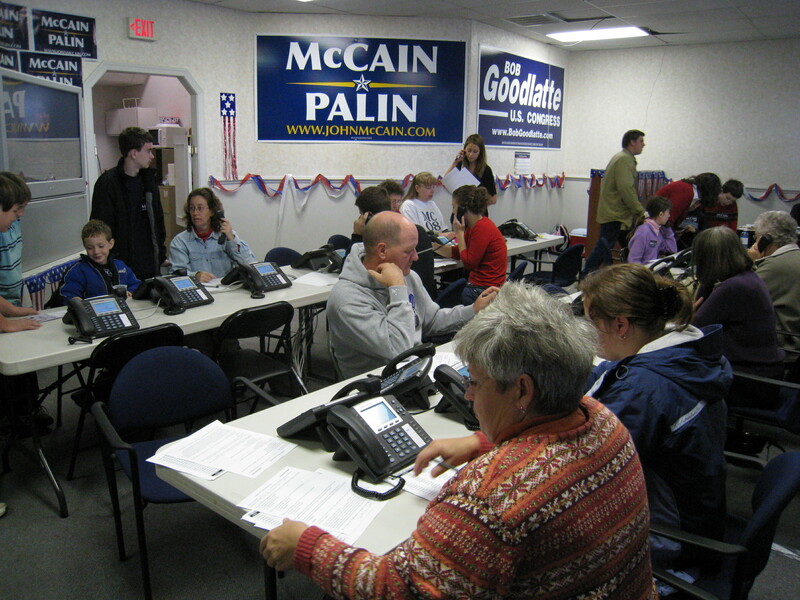 Even though the experience was not terribly exciting, I thought that there were two extremely amusing moments during the event, both from our local McCain representative, Michael Ganoe. First, as he implored the attendees to volunteer during the last two week period, he stated that we should forgo our social and recreational activities, like our children’s sports, because, I kid you not, if Barack Obama wins then we will no longer be able to enjoy these activities. That suggestion was greeted by a vocal amen from one man in the crowd. Although I know the importance of hyping every campaign, the suggestion is still ridiculous! It further illustrates the tactics of fear that have become so commonplace to the campaign. Should we all leave the country if Obama is victorious? How soon until we are rounded up into camps? If McCain cannot win on his own merits (which I believe is impossible), then they resort to demonizing Obama. The second funny moment came once Congressman Goodlatte arrived. Here Mr. Ganoe, along with the crowd, thanked Bob Goodlatte for voting against the bailout. If only Senators Warner and Graham were there then, I would been interested to witness their reactions as they, along with Senator McCain, both voted for the massive corporate welfare. If that issue is as important to you as it is to me, how can you support a candidate like McCain who rammed the bill through Congress irrespective of the Constitution? 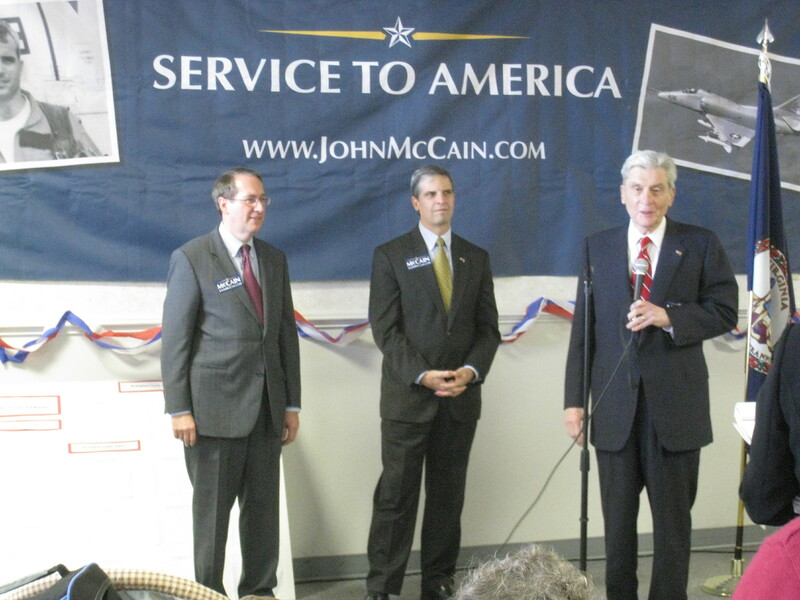 Later, Senator Warner arrived, followed by Senator Graham and they sang their praises of Senator McCain. Although they sounded fairly reasonable, (at least for neoconservatives), unfortunately both speeches focused more on what’s wrong with Barack Obama rather than what is right about John McCain. Senator Graham stated “If we send one more dollar of your money to Washington DC in the name of compassion we’re going to break the back of business and some of you are going to lose your jobs.” So true Senator Graham. Good thing you voted for the bailout huh? I think I’d like my excess tax dollars back rather than ship them off to failing corporations. I guess, unlike you, I’m not very compassionate. After his speech, Senator Graham parroted McCain’s plan of compelling the federal government to buy up the bad mortgages. Good idea! I’m sure that plan won’t require more dollars to be sent to Washington. But what’s a post about an event without pictures? Oh, oh…what is this? A shaky video too? Hot dog! Here. Enjoy! A few hours ago I got an email from the local GOP indicating that Senator Lindsey Graham (SC) as well as Senator Warner will be coming to Harrisonburg tomorrow in support of Representative Goodlatte. This email raises numerous questions. First, why would they announce the event less than 24 hours in advance? Won’t turnout be extremely low? Second, why are liberal “maverick” senators like Graham and Warner supporting Goodlatte? For the record, Warner hasn’t supported Gilmore and, most likely, will not do so. 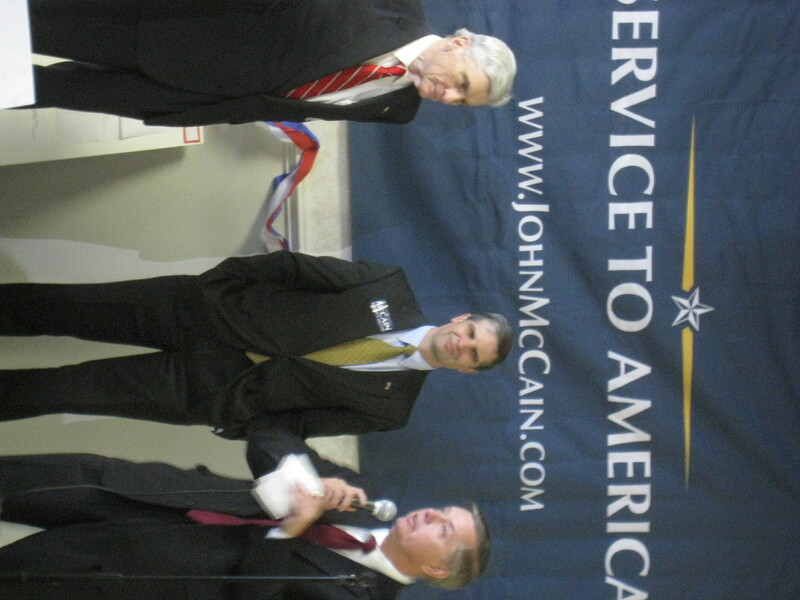 Also, shouldn’t Graham focus his time on his own re-election bid against Bob Conley? Third, and perhaps most importantly, why the heck would a conservative like Goodlatte want face time with Graham and Warner? It is strange, very strange indeed. If I can make it, I’ll let you know what I can find out. Update: I suppose that Louis is correct. Calling Warner and Graham liberals would likely be incorrect. They, like McCain, sometimes have liberal policies and sometimes have conservative policies. Unfortunately, they are not wed to the strict conservative philosophies of limited government and personal responsibility. I believe that both South Carolina and Virginia are conservative enough to find Senators who are closer to true conservatives (Conley and Gilmore in the present election).